Maureen died on 20th October 2018. This account of her life is based mainly on my eulogy to her given at the Requiem Mass on the 14th November and held, as she had wished, at St Mary’s Church, Harvington. It also draws on the written recollections of family and friends of key phases of her life (childhood, schools, university, and career) and some of her passionate concerns (art, singing, history, shopping, most of all, her pupils). All ten, along with photos and examples of her art, are to be edited and bound into a booklet of remembrance. In writing my eulogy I tried to be guided by Maureen's unease, expressed with her usual vigour, about being the subject of an unvetted eulogy, even mine. What she hoped was for me tell her story, or, as she immediately added, our story, in full colour but without exaggeration. This was typical. For one so beautiful and talented with so little to be modest about, she was never, ever, boastful. Even so, in truth, I have found it very hard is to do justice to my amazing wife. But in doing so I have been able to draw on a torrent of admiring messages from those who knew her including, perhaps especially, so many of her former pupils. Maureen had a good life, full of achievement. Her story began on the 16th August 1947 in Brixton. Her father, Guy, had been a soldier. Wounded at Dunkirk, he was with the troops who fought in Italy. Her mother, Eileen, was born in Ireland where she lived on her father's farm by Roaring Water Bay, in County Cork. Both were highly intelligent people whose life chances Maureen felt had been much inhibited by a lack of educational opportunity. But they gave her "a very stable and happy home life". Loving and supportive, they were enormously proud of their remarkable daughter, and greatly influenced her values. Her school days were, on the whole, happy and fulfilling; she remembered several of her teachers and many of her fellow pupils with affection. She told me many stories of her time at St Stephens, her primary school, but the one that sticks in my memory was a complaint that she was the tallest girl in her class with only one of the boys being taller. Fortunately, her growth slowed and she topped out at a full five foot six and a half inches (the half was vital). At St Joseph's, her convent grammar school, she was an outstanding pupil capable of a university place in almost any subject. As fellow pupils' recall "the first time I really understood she was actually very clever…was when we got our O Level results, and she got 10 straight 1s. (She) was in a different league from the rest of us. She was never boastful and certainly never sought the limelight", and (She) was "the brightest diamond of our year, and so delightfully modest with it". She chose Science and Maths and was alone in her year in being offered an Oxbridge place, to read Physics at Lady Margaret Hall. 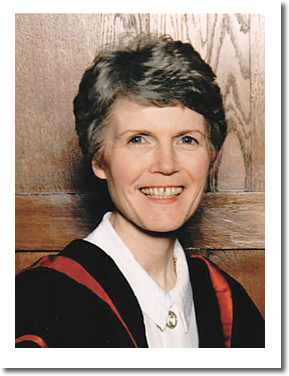 She recalled her four years at LMH with great warmth: blessed with the gift of friendship several of those with whom she was closest then were present on the 14th (the funeral was 14th November 2018). 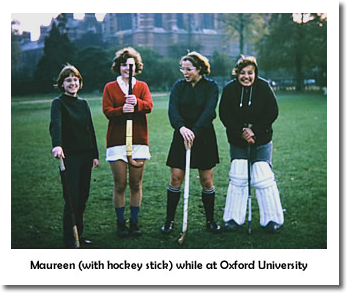 As a college friend recalls, "Maureen loved Oxford, and the chance it gave her to meet people from all sorts of backgrounds and to develop her own ideas and interests". It could also be intimidating given that in her year there were only 13 girls reading Physics as against 200 boys; perhaps so, but the Maureen I remember was not easily daunted – and of course she was exceptionally attractive. On graduating, various further study and job opportunities came her way, but "she knew she wanted to teach, and stayed in Oxford to complete the PGCE course". This launched a spectacularly successful career in education. To my immense good fortune, she did her teaching practice at the all boy's school in which I was working. Almost all male teachers, when the Head brought her into the staff room there was a startled silence. As a colleague with far more eloquence than I can hope for recalled: "I, too, remember vividly when I first saw Maureen in the staffroom. We the younger staff were certainly entranced. To be a moment's ornament'. As soon as I could I took my place in the long queue to ask her out. Happily, she agreed. We went to a concert on a Tuesday and I asked her to marry me on the Saturday. For those who know me, this may seem oddly decisive but the mode of my proposal was less so. "If I were to ask you to marry me, what might you say?". To my astonishment and joy without hesitation she replied "If you were to ask, I might say yes!". I asked! 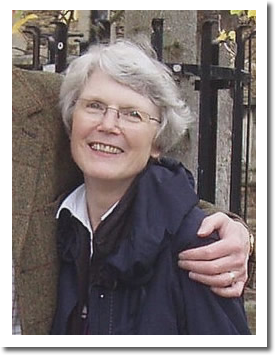 Having qualified she worked in five very different girls' schools, three as head teacher. As so many of her pupil's attest, she was an exceptional teacher, "She was part of the reason I studied sciences", "I remember her mass and weight lessons twenty two years later!! "," She gave me the Physics 'bug'", "She always taught Y7 Physics for half a term with each form…mass and weight, baking a cake on Jupiter, and for some reason the school song". Her assemblies were a source of wonderment to staff and pupils alike, "I remember the assembly when she got all of the items out of her desk drawers and had races with them on stage!! ", "She was quite the character…I loved her assemblies...remember the warm fuzzies? Lead in your pencil? Calendar change? Buying fish with no instructions? Surrey (or as a member of staff recalled it 'Sulky') with the fringe on top". Or as another member of staff put it "Her assemblies were always memorable…When excited she would beam at the school and bounce on her heels at the edge of the stage". A great teacher, she was arguably at least as good a head. Appointed at the age of thirty-one, she was the youngest woman head of a state secondary school in the UK. Also, probably uniquely, over the next twenty-one years she led successively a comprehensive, a grammar, and an independent school. But she regarded her fourteen years at Wolverhampton Girls' High as the pinnacle of her career, taking over an undistinguished grammar school and leaving it, as it still is, one of the very best in the country. Again, many at her schools, especially at WGHS, remember her as a great headteacher. First the pupils: "She was a wonderful headmistress", "My first flashback was of her rocking back on her shoes, arms crossed (many mention this) looking very much in charge! Fond memories, she was fair and ran a tight ship", "She was a lovely woman and had such a presence around the school", "I found her regal, in her perfectly pleated long skirt and her academic robes", "I will never forget her. Quite the headmistress. Thank you for all you did for us and the school". Staff said much the same: "There was time for creativity and fun under her leadership as well as hard work", "As a head she was bold and brave – her decision to make the Girls' High one the first…grant maintained schools in the country is probably the reason it still exists today", "Under her leadership, the school began to produce amongst the best exam results in the country" (and the first of four 'outstanding' ratings by Ofsted). "Being part of her (Senior) team was a totally immersive experience – it wasn't just a job…We worked incredibly hard, but we also had lots of fun". And finally, "She was a remarkable headmistress – knowing the name of every girl because she ensured she taught each one in Year 7: fierce in her protection of the girls' rights and opportunities, supportive of those having problems, and meticulous in her prestation of work". But however good you are, long service in headship is very wearing and so Maureen took early retirement intending to pursue her long-standing interests in Art and Music. On completing a Diploma in Botanical Art (which nicely complemented her second first degree in Botany) she spent a decade honing her skills and proved unusually gifted. Thus, our home, and that of many friends and family, are adorned by her botanical paintings and, latterly, lino-cuts. 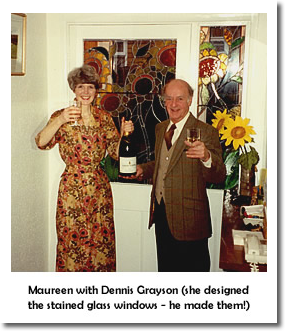 Her liberality in this, as in much else, is attested to by one of her closest artistic friends; "Maureen was extremely generous and would often buy an extra (art product) 'find' to give to friends". Her botanical work was "very accomplished. She had an excellent sense of composition and…Her colours are true-to-life and fresh; her paintings are lively and show not only her love of plant material but also her understanding of botanical subjects". Rather less gifted in music, through sheer hard work and the support of her singing teacher and choir master, she became a competent choir singer: "Maureen was aware that she didn't have the best voice in the world. She was, however, very determined to improve! As with everything, she worked hard and with enthusiasm and commitment, learning notes, practicing vocal exercises, improving her breathing and working on vowel sounds. I've often wondered what Peter made of it all!" (I was delighted; it gave her a sense of achievement and it made her happy). The last two contributions to the booklet will focus on, first, Maureen's love of History (and chatting) and, second, on her love of fashion and shopping. With regard to the former, I was always a great disappointment to her because although I read History at university I only really wished to discuss modern history whereas Maureen's main, and considerable, interest was in Tudor and Stuart history. But happily, she had friends who were more accommodating. As one put it: "Maureen could easily hold her own with me on historical subjects in which she was interested despite the fact that I read history at university and taught it at one stage in my career…(her) bookcase was full of history-fiction and non-fiction". For my part, I was once unwise enough, when the two of them were having a conversation on this theme, to attempt some lofty and dismissive criticism of historical fiction in general whereupon they both turned on me and I wisely and quickly retreated to the kitchen to make lunch. But, with this friend, and others, what Maureen loved was to talk: "Extremely intellectual, she also had a wonderfully frivolous side and I can honestly say that during our friendship she was one of my favourite gossip partners. Our chats, many over the telephone…never last less than an hour and often longer". Such conversations touched on many topics some serious others less so but, as with others with whom Maureen had lengthy chats, these often took the form of profound homilies on fashion and shopping. This, then, must be the subject for a contribution to the booklet. As its author puts it, "If this area of study had been a degree subject, Maureen, without doubt, would have been awarded a first-class degree. In fact, such was her dedication to it, she would have been awarded a doctorate…I will miss our phone calls when we sorted out world problems, planned future purchases, and Maureen updated me on the latest news from Ambridge"
Her last years were often hard, dominated by a continuing struggle with cancer during which she endured three rounds of chemotherapy, two major operations, hormone treatment and radiotherapy. Many who know her recent history share my awe at her astonishing bravery and the cheerful, positive and optimistic spirit in which she faced each new phase of painful and debilitating treatment. Almost throughout she remained the feisty woman that so many of us loved but over the last few weeks she became very gentle, accepting and grateful for any help. She was always concerned with the welfare of others. As a friend said, "I shall always remember her concern for everyone else when she was so ill herself". This was especially true for me. So, whilst I take some consolation at being told by friends and family that I did my best to look after her, I know the wrong person is being complemented. Maureen was, quite simply, a wonderful patient. What, then, can I say in a final accounting of what so many of you have described as a 'lovely lady'? Well, Maureen was searingly honest ("it is a good thing she is not in the diplomatic service," as somebody told to me admiringly) which did not always make life easy. Given this, she would want me to acknowledge she had a daunting temper ("she would give you the stare"), and could be impatient, stubborn and judgemental. Weighed against her virtues these were minor imperfections. As so many have said she was, amongst other things, and in no particular order (she loved Strictly), courageous, compassionate, charitable, caring, comical, clever, curious and cheerful. In addition, as a long-time colleague put it, "she had a strong sense of duty and very high standards" which she expected of herself and others. Heaven help my namesake St Peter if, when Maureen arrived at the gates of paradise, he was found wanting. In closing, I will quote from two further messages – the first offered words of consolation, the second words of hope. As we say in Ireland, "Ar Dheis De go raibh dhilis" – which means "may her faithful soul be at the right hand of God ".